Concerning the production of leather we are mainly busy in the range of finishing of upholstery leather of any kind. Particularly in view of “staking” and “application” we earned a leading position in the past years and decades, due to our machines VIBRASOFT and LEPRINTA. We are the leader in the market with the backside coating unit for leather and PU-stamping parts, consisting of DUBLASA – LEPRINTA – TROLUX. 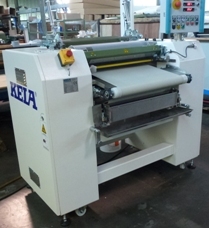 buffing machine FULMINTAas single machine or as complete buffing unit.